I'm Patricia Blackstock, owner and webmaster of FunBeaches.com My husband and I have been vacationing at all-inclusive resorts yearly since 1997. 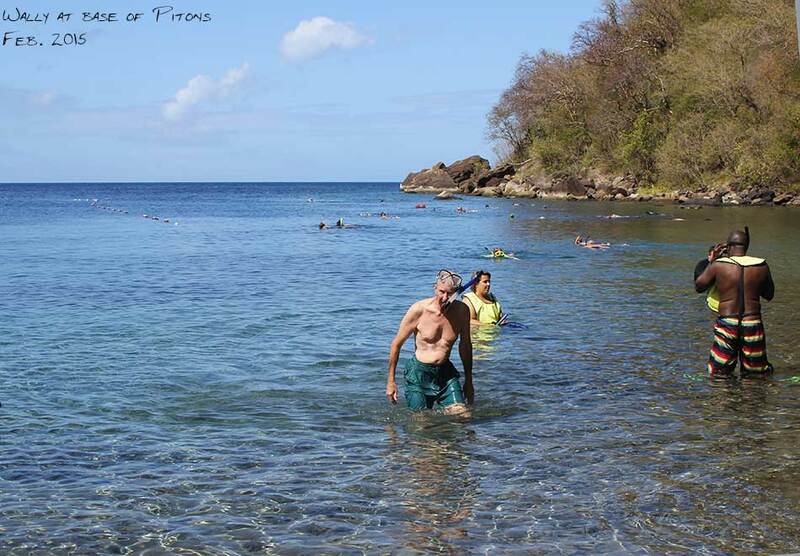 However, this year we selected the Exodus Adventure St. Lucia I searched the web for reviews, and talked with some Sandals guests who told us to "watch for the Exodus Adventure guys wearing red shirts" and strolling the beach. 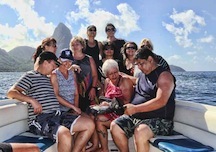 I was torn between a sunset cruise to the Pitons (offered through the Sandals Resort) and a tour that would include other stops. and options. The Exodus representative showed us photos, pointing out the various stops during this adventure. These photos convinced us that we would enjoy the cruise offered by Exodus Adventure more than the sunset cruise through Sandals. 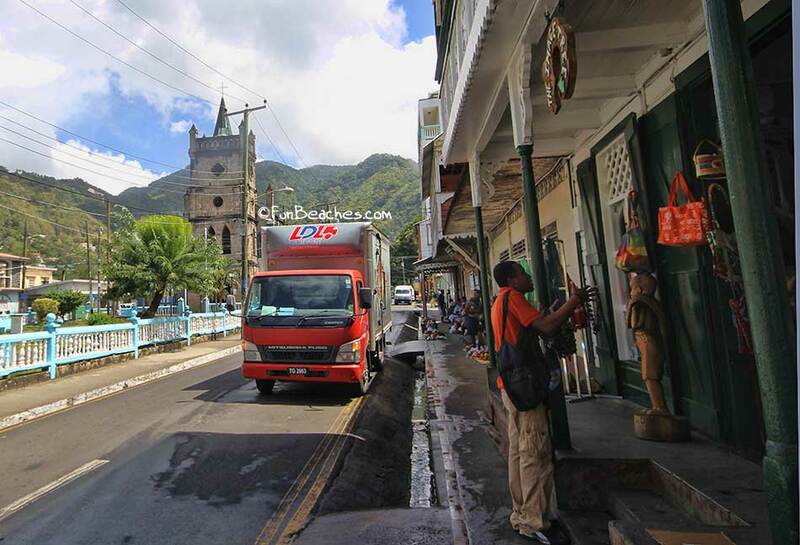 The Exodus included snorkeling, a visit to the Pitons, waterfall, a local prepared Creole lunch, and a power-shop at a local store for 15 minutes. The price was the same as the Sandals cruise -$100. per person - and the boat was conveniently docked for pickup , just outside our room. We left at 9 A.M. and returned to the Sandals St. Lucian at 2:30 P.M. The Exodus Adventure St. Lucia cruise turned out to be even more fun than we anticipated, and we certainly got our money's worth. It was professionally conducted, filled with history that was educational and at times humorous. "Do you know why our palm trees grow so tall and sturdy?" We guessed a lot of rain due to the West Indies location and the ability to withstand strong winds. But the answer was really quite simple: "to protect their nuts." 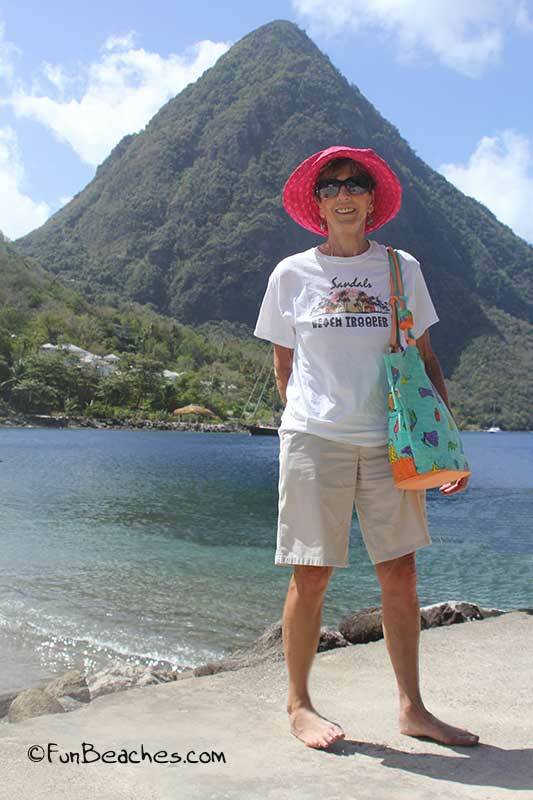 Seeing The Pitons was our #1 reason for taking this cruise. 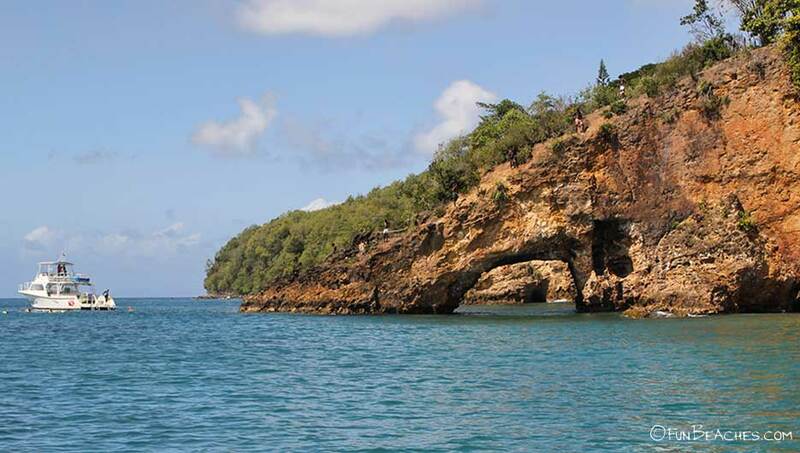 The Pitons are one of St. Lucia's most iconic attractions and a must for nature excursions in St. Lucia. 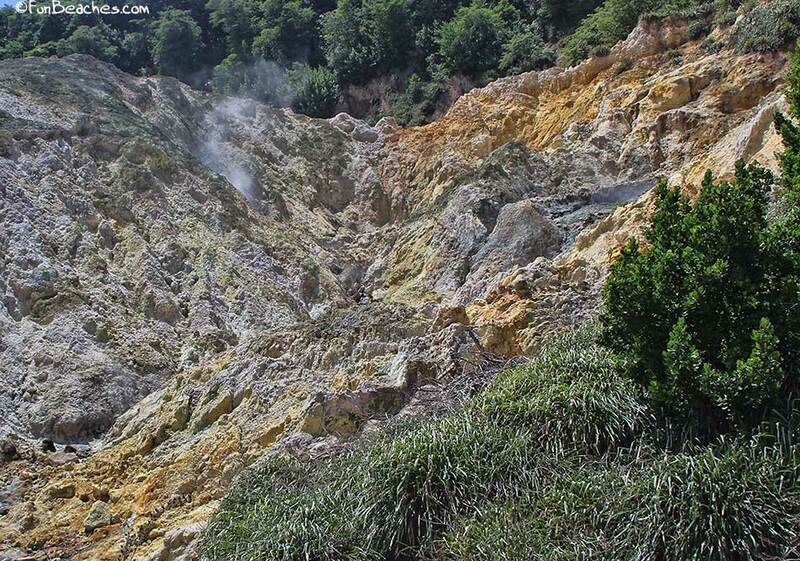 They are located just south of Soufrière and can be seen from the sulfur springs as they stand over the bay. We had about an hour to snorkel at the base of the Pitons. 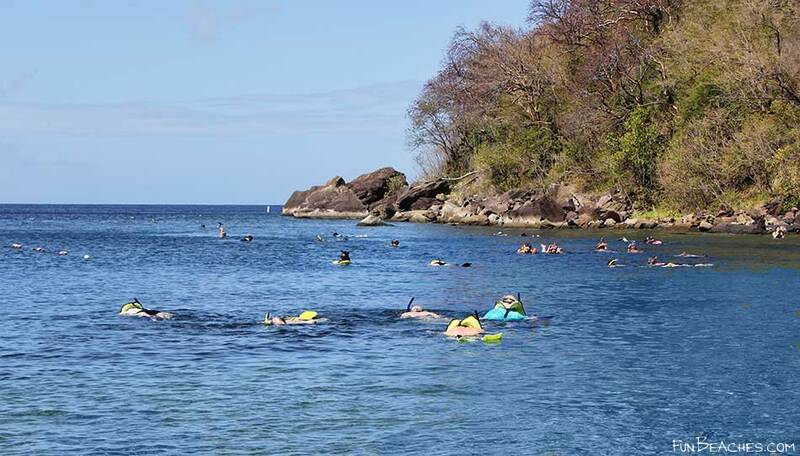 The Jalousie offers visibility of 20 - 40 feet, making it perfect for snorkeling. The dramatic coral is is home to many beautiful neon-colored fish including Parrot-fish, Red Snapper and many more. The beauty here is amazing! Exodus Adventure St. Lucia stopped at the base of the Pitons and we walked a short distance to the shore. I'm not sure of the exact location of the the beach, but the chairs/lounges where we stopped were in miserably deplorable condition, some with missing seat bands, rendering them impossible to use. The bathroom was abominable and there was a powerfully bad odor coming from toilets that would not flush. This filth fell over the toilet bowl and onto the floor where many people were barefooted. The unhygienic and unsanitary beach area was a complete contradiction to the awesome beauty of the Caribbean waves that lapped onto the shore. It was difficult to imagine so much grime could coexist alongside such beauty. The stench made my stomach woozy. We would have been much, much better off to snorkel from the boat. I hope in the future, the Exodus Adventure will avoid his so-called beach and seek out a better place to stop. Or better yet, encourage you fellow travelers NOT to leave the boat. If your boat approaches this stopping place and if it has not improved, I hope you will immediately and head back to the boat - then refuse to leave it again. After leaving the snorkeling area, the Exodus Adventure St. Lucia visited the volcano where we were invited to a sulfur mud bath, guaranteed to make you look 10 years younger. Or not. But as you can see in the photos below, good times were happening. After the mud bath, everyone rinsed off in the Piton waterfall, which boasts a drop of about 30 feet. The water here is warm and bathing under the falls is invigorating. (Enlarge the photo of Wally at the bottom of the falls, yo get an idea of the height...and be very careful of your feet. The base of the falls is covered with sharp stones. 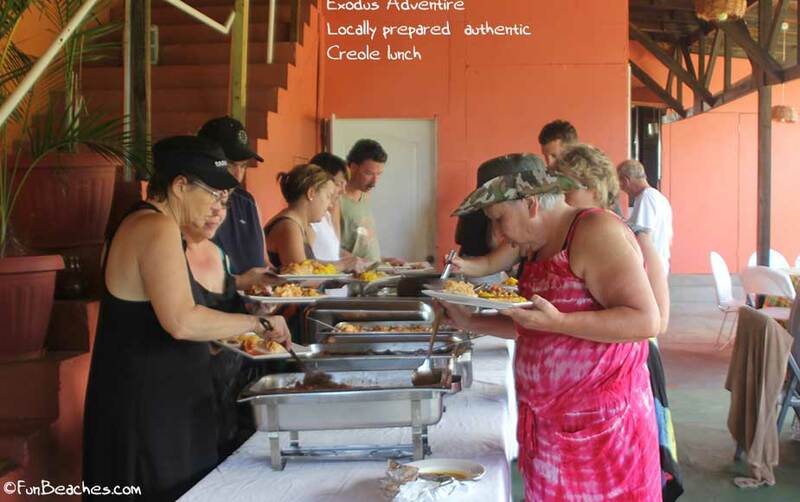 Exodus Adventure St. Lucia Lunch: The local buffet was very good. It offered many local dishes including spices, garnishes, fruit, fish and meat are all grown in St. Lucia - an excellent variety of Creole dishes. While the shopping trip was not long, we enjoyed browsing the hand made items, and ended up buying two good-quality t-shirts for $12. each. Exodus Adventure St. Lucia return trip to the resort: We were offered a variety of drinks throughout the cruise, including Coke, bottled water, fresh fruit and run drinks. Near the end of the cruise we were all offered shooters. 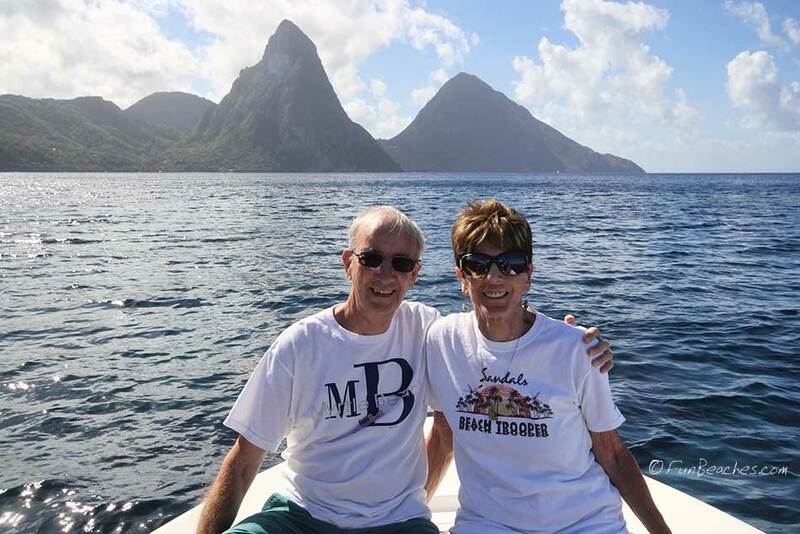 We loved our Exodus Adventure and I would recommend it to anyone wanting to see the Pitons and visit the local area including area during your St. Lucia vacation. With the exception of the grungy, stinky beach mentioned above they provided exactly what they promised! Here's the website for Exodus Adventure! Our Exodus Adventure. 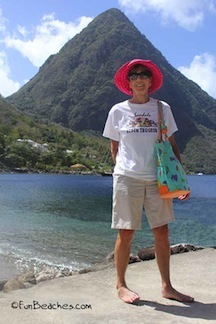 First stop - The Pitons are located near the city of Soufriere. 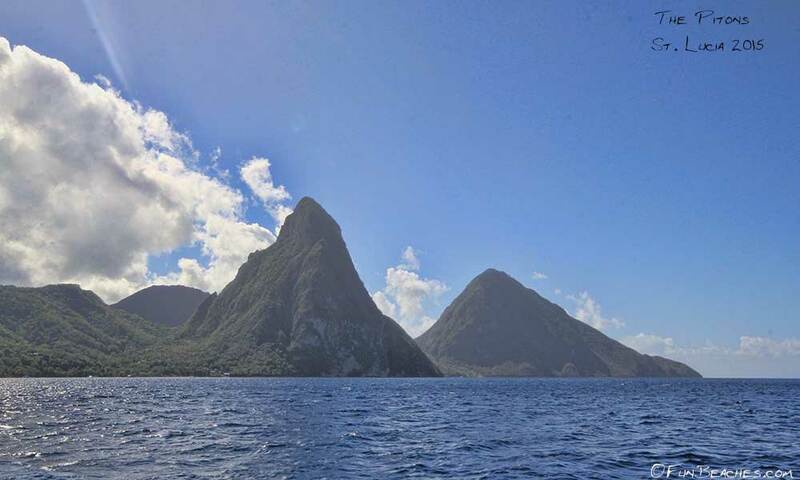 These are two mountainous volcanic plugs, volcanic cones, in one of St. Lucia's most beautiful areas. 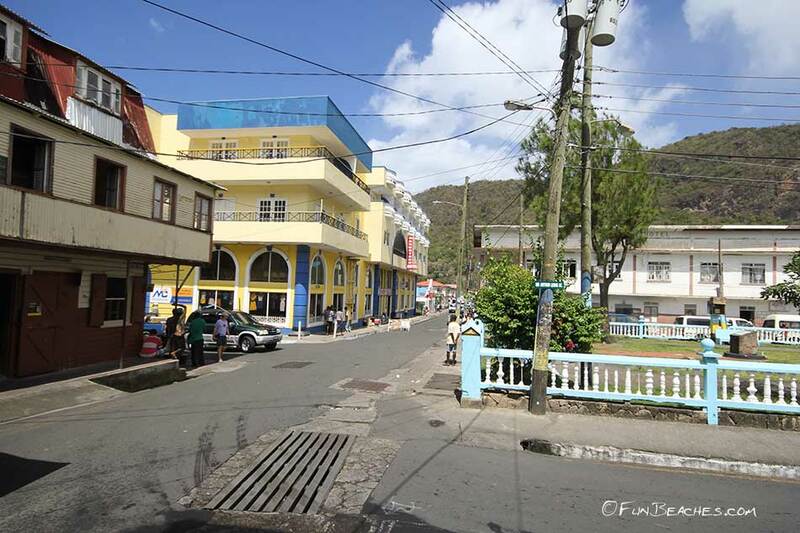 The Gros Piton is 2,530 ft high, and the Petit Piton is 2,438 ft high. 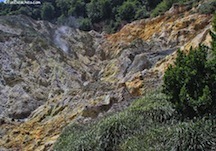 You'll find sulphurous fumaroles, hot springs. They are linked by the Piton Ridge. The Pitons were designated as a UNESCO World Heritage in 2004. The beautiful view on the left was one of ther scenes featured as the backdrop for one of the Pirates of the Caribbean movies.